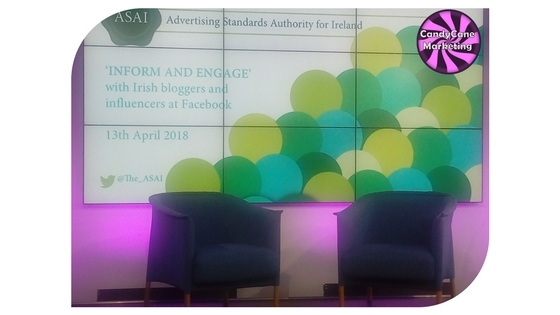 On Friday 13 April 2018 I was at Facebook Dublin for the ASAI Inform and Engage Event for Irish Bloggers and Influencers. I was part of the group who received an invite from Darragh Doyle in Irish Bloggers Group. The main purpose of this talk was to clarify the rules and guidelines for bloggers and influencers about what is and what is not marketing communications. In essence how to know when blogging turns to sponsored blog post ads. The time on the invite said 9.30am, so at 9.15am I walk up the steps to Facebook and check in for the event. After getting my guest pass we were told to stand to one side, as we would be taken in groups up to the 6th floor meeting room. A few minutes later one of the Facebook event team gave the go ahead and I joined the next group for the lift up from the lobby. First things first, coffee and a croissant and then I spotted some familiar faces. I had a great chat with Katia from Irish Bloggers Group and then we went into the room. There was a great buzz in the place despite the early time. At about 10.15 the event began with an introduction by Al Dunne from Unique Media. Then the first speaker, the one everyone was here to see, Orla Twomey, Chief Executive of ASAI. This blog post has been written using the notes I took during the event. Orla gave a lot of information in her talk. She started with an overview of ASAI and explained its mission statement. She then went on to explain the ASAI Social Media story. 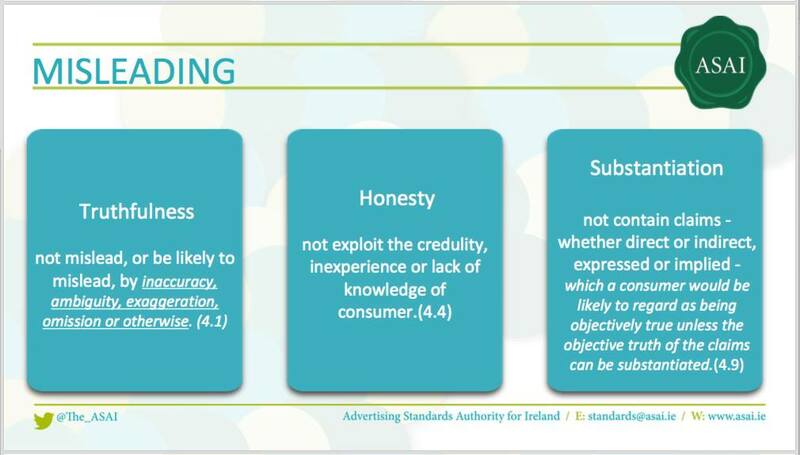 The ASAI’s role is to tell bloggers and influencers how to engage with marketing communications. The ASAI guidelines have been in existence for 37 years. Their job now is to look at the existing rules for traditional advertising and how to apply them to digital and online advertising. 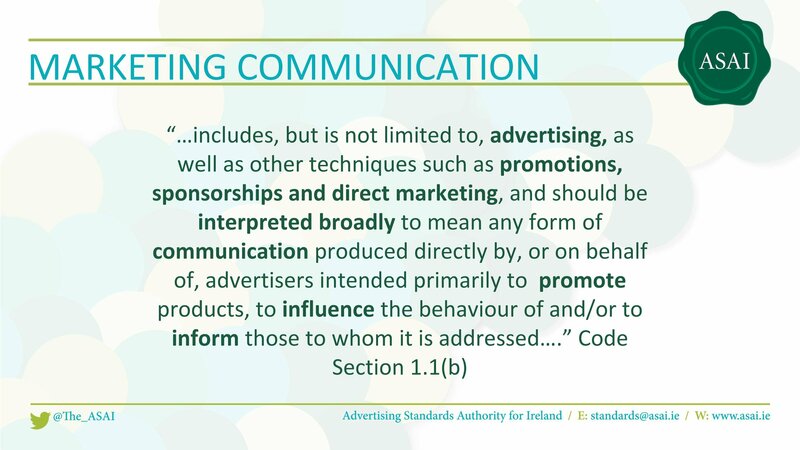 The ASAI remit follows where marketing communications goes and changes with the times. In essence it means that advertising by companies and brands must substantiate the claims they make. Example: if a blogger has been asked to review a product and the brand or company has said we will give you vouchers for a positive review. If a blogger gets a free product and the company says that we will give you this product for free but you must do a blog post and promote that product on social media . Affiliate links according to ASAI means that the blogger is taking on the role of the advertiser and this needs to be disclosed. Question:What turns a blog post into marketing communication? Answer: When there is payment and control. Payment does not just mean money, it can be a reward or benefit in kind. The blogger will have a contractual obligation to do something. 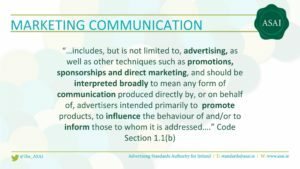 Question: What is not marketing communication? Answer: when the blogger has no interaction or direction from the company or brand. The blogger will have no contractual obligation to do something. Always try to see things from the general consumer’s perspective. If the general public saw this, would they know it is an ad or marketing communication? For something to be marketing communications it must have the duel test of payment and control. Affiliate Marketing turns a blogger into an advertiser. Affiliate discloses needs to be at the top of the page. If a page has 3 affiliate links and 3 non affiliate links, affiliate links needs to be disclosed on that page. Health and Beauty Advertising has specific rules and guidelines. Prescription items are not allowed to be advertised, this includes Botox. The same rules apply for bloggers as for traditional media advertising. Blogger to blogger complaints fall under interested parties. With interested party complaints, the complainants must agree to be identified before the complaint can proceed to investigation. Most people complain due to a personal reason or because they think something is wrong. There has been a huge increase in complaints due to the influence of social media, in 2017 there were 110. In 2016 they did not have any. The ASAI only act on complaints. They do not regularly monitor the blogging community. However, in the past they have monitored a small number of high profile bloggers for disclosure. The advertising ecosystem is evolving. By co creating content, bloggers are placing themselves in the advertising industry. Advertising is promoting a product. Bloggers should use the disclosure tools such the branded content tool on Facebook and Instagram. On a blog post it needs to be at the beginning of the post. On YouTube videos it should be said at the start of the video. When using photoshop, bloggers are required to be honest. Photo shop cannot be used to show the effect, example in before and after photos, the blogger cannot photoshop a photo to show weight loss. If there is an exchange of payment and control, it has to be disclosed. Question: Whose issue is it when a blogger is asked not to disclose? Answer: Ultimately it is the advertiser. But bloggers should ask themselves do I want to work for a brand or company who is asking me to go against the rules? Is the short term gain worth the long term repercussions? Question: What are the sanctions for not disclosing? Answer: The ASAI operate a name and shame policy. This damages the reputation of the blogger and brand, which ultimately damages the earning potential for the blogger. The Consumer Protection Code is different to the ASAI. 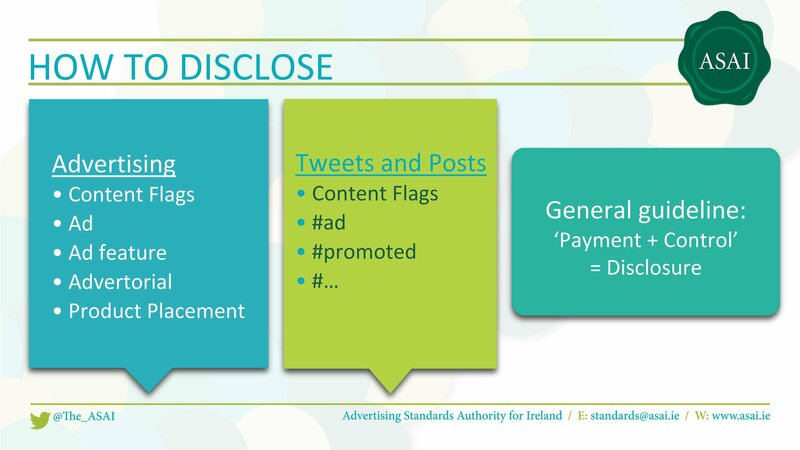 They require disclose for advertising. For ASAI there must be payment and control it must be disclosed. For the Consumer Protection Code if there is payment it must be disclosed. 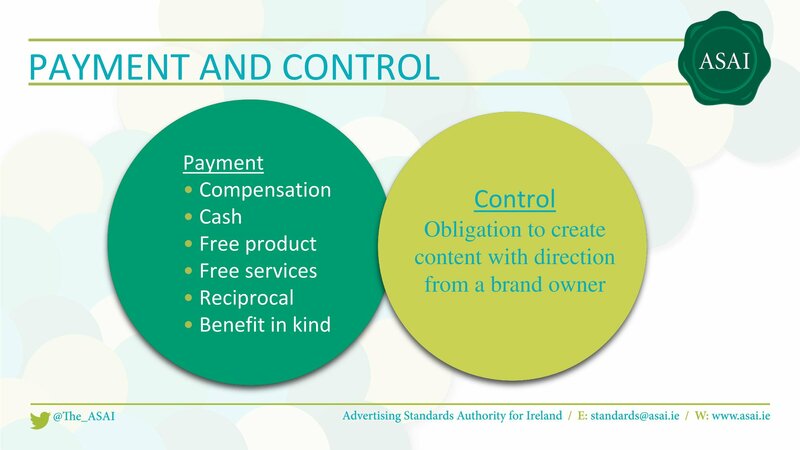 Control according to ASAI is when a brand or company put a contractual frame work. This changes a blog post into marketing communications, even if no actual cash has changed hands. Payment can be reciprocal, for example a free meal, a free beauty treatment, discount vouchers etc etc. If a company gives you a discounted rate for a product or service this is payment according to ASAI and it must be disclosed. If an blogger pitches to a company or band the same rules apply. Example: If a blogger approaches a restaurant and says in exchange for a free meal I will write a blog post and post on social media.